"The honour would be entirely mine if you would attend my little party." It’s the roaring twenties – an era of bootleg liquor, red hot jazz and hedonistic pleasures. Jay Gatsby has invited you to one of his infamous parties and that's not an invite you want to turn down." Review: I've ranted before about how much I love immersive theatre, and so I think I went into this making two mistakes. The first was having expectations, you should never presume with a show like this ( because when you presume you press you to me and that's just weird -#Sorrynotsorry) and the second mistake was that I went home (but I don't think I could have known that to be an issue before going). 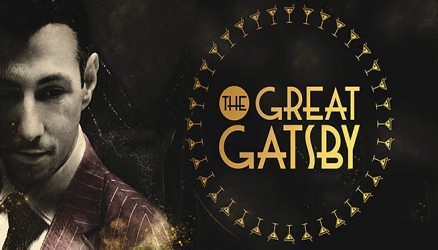 This immersive experience plays out the story of Jay Gatsby, immortalised in the F. Scott Fitzergerald novel The Great Gatsby. Gatsby is a chancer, a gambler and a man of mystery. An enigma to crack, by one with heart, a heart that has been taken and consumed by Daisy, and when life brings them together again sparks fly, and not just because someone has set off some fireworks. If you do go and see this, my advise would be to dress up, not only does it get you in the mood, you also don;t then feel like a lemon when everyone around you is dressed up. There was a great vibe, drink was flowing, it felt like a party. This is what Gatsby would have wanted I felt. Then out of no where the action kicks off and you're taken into their story and moved through the sets. In any immersive piece of theatre sets are vitally important, and when you;re trying to do what they were then it becomes more difficult because you have to have a multi functional set. It was nice, but that was kind of it for me. It worked for it's purpose but me wondering around by myself i was paying more attention and i wanted more from it. The show really tries to get you in the mood of the twenties, teaching you to swing, having a fully operating band that played you in and out and provided some great moments for the theatre. There set itself isn't massive so there isn't a lot of diversity in where the actors can take you, but they did well with that they had. This then leads on to the main problem I have with immersive theatre.You never get the full picture you get pieces and you have to piece them together depending on how you you travel round and who you choose to follow. It was also a fault of the set that depending on where action was happening you got a lot of feedback from the crowd talking, so bits got mixed in and you could only appreciate it if you were there next to the actors. But you got the story. I felt it helped that i'd seen the film (yes i know..i know) so I had an idea of the plot, but as an experience, you get the key elements, you get the moments. The actors to their credit got full force into, emotions were on point, you felt part of their moment and accents were on point (for the most part). For all the faults that am almost looking to find (i can't help it) this is a fun show, full of life and energy and if you want a good 20's night outgo and check this out.